Branken Hof is a family enterprise, and apart from our own breeding stock, we have dedicated ourselves to the boarding business. We breed and raise horses on behalf of our customers and care for old age horses. We focus on horse's individual needs and healthy feeding, and we keep all of them in age-appropriate herds during the summer on our summer pastures. Depending on the summer weather and date of birth, the foals and their dams are either kept in the stalls at night or outside 24 hours on our home pastures. During the winter months, weaned foals and youngsters up to the age of two or three are kept in groups in large stalls, adult horses in individual stalls - depending on individual necessity, too - we don't go by the rule book! There are two large sandy paddocks for daily turn out during the winter, a summer outdoor riding arena and a round pen. An indoor riding arena is only a stone's throw away. We treat all horses as our own, calm, but with the necessary respect and competence. 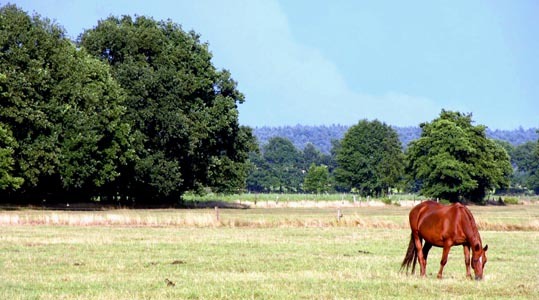 We produce the roughage ourselves and contribute to a healthy and individual feeding of all horses stabled at Branken Hof. regular training of foals to get used to humans, the farrier, halters etc. We are prepared to care for horses of foreign customers (English/French).